The Lord has indicated that he is coming soon, and He is going to do mysterious things before He comes. Because His time is short, He will use a madman, He will use a prostitute, He will even use a child that doesn't have any teeth in his mouth to testify of His coming before He comes. That is why we must correctly discern the things of the Spirit. One can be very knowledgeable of the Scriptures, and still make a wrong judgment in this area, just as the scribes did. A pastor, named Yong Doo Kim, whom I love and respect, has explained it like this. Just because someone has a difficult time believing the manifestations of the Holy Spirit, they must never judge or insult the work. We must be careful not to blaspheme against the Holy Spirit, which includes neglecting, ignoring, or totally opposing the gift of tongues, prophecy, miracles, and interpreting tongues. It includes aggressively opposing the gifts that have or are manifested in different ways. The spectrum of blaspheming against the Holy Spirit is very broad. At one end of the spectrum are those who incorrectly make allegations, based on their prejudices and humanistic views. At the other end are those who judge and condemn others who operate in the gifts, as well as those who deny or reject the work or manifestations of the Holy Spirit. Those are the people who so easily drive out the work of the Holy Spirit and judge it as a cult or condemn it. Therefore there is the risk of progressing into the sin of blaspheming against the Holy Spirit. On one hand, we should avoid the error that some have made of accepting every supernatural manifestation as genuinely coming from God. People who do so tend to be mystical and easily deceived. However, we must always cherish the presence and power of the precious Holy Spirit in our lives, and be careful not to lose it. If we do, we could move into a place where we are left with nothing more than a cold doctrine of the Holy Spirit. Once you do so, there is the possibility that this could eventually lead to blaspheming the Holy Spirit. That is an eternal sin, which cannot be forgiven. Those who commit this sin will be greatly judged and tormented in hell. Therefore, we should love Him and fear Him. "You shall love the Lord your God with all your heart, and with all your soul, and with all your mind, and with all your strength." (Mar 12:30) And "do not be wise in your own eyes; Fear the LORD and turn away from evil." (Pro 3:7). Hopefully this little study has helped to restore you to a correct perspective. Attribution notice: Most Scripture quotations taken from the NASB. 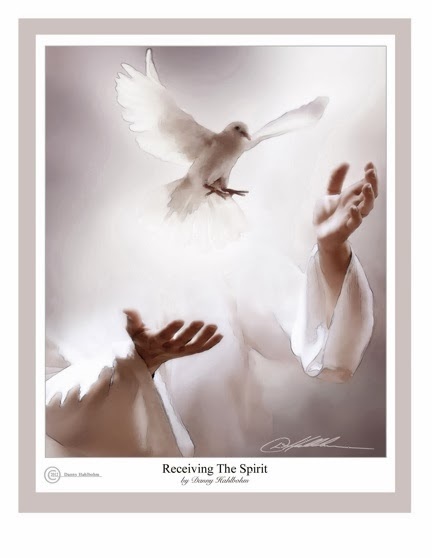 "Receiving the Spirit" painting © 2012 Danny Hahlbohm, all rights reserved by the artist. Author's note: Also see False Blasphemy of the Holy Spirit, Discerning the Things of the Spirit, A Warning to the Nay Sayers, Testing the Spirits of False Prophets and Eternal Destinations. You can access the Main Directory for this blog for more articles like this, as well as my complete blog directory at "Writing for the Master." Now I'd like to ask a very important question. What if you called Christianity a pagan religion once but now repent of it, will you be forgiven? What if you posted that online before and you can never take it down, do you have no forgiveness cause it's still there? Even if you are a Christian now? Dear Melisa, you are so precious to the Lord. He is so merciful to us. If you have repented sincerely and asked forgiveness, our God is so wonderful that He even forgives such terrible sins. Imagine how the apostle Paul must have felt when the Lord forgave him for persecuting Christians and approving of the murder of Stephen? He who is forgiven much loves much. Many of us have done some terrible things that have caused great damage to human life, and when we come to Christ, we find forgiveness. As for the irreversible nature of your comments, there is still something you can do. 1) you can pray that your godless comments would have the opposite effect on everyone who reads them, and that they would actually see the futility of your words and be drawn to the Lord all the more, 2) You could speak to the webmaster of the website and request that your comments be removed. Any comment posted on the internet can be removed. No web posting is permanent any more than anything you create in your computer is permanent. That's why we have "delete" buttons. 3) If the owner of the site is unwilling to delete your past comments, then go out there and post new comments saying that you have come to Christ and you recant what you said, and that you realize now that you were so wrong, that serving the Lord is the only way to live, etc. Is blasphemy against the Spirit a process or an immediate thing? Had the scribes who spoke against Jesus in the Mark 3:22 committed this sin and are they then doomed and without hope even as they live on earth? Is there anywhere else in the New Testament where I can find a teaching about this? Thank you for your writing Len. Reint-Jan R, As for a teaching about it, I am not aware of any place else in the NT where it is taught. It is a sin, according to Jesus, and an eternal sin at that, which cannot be forgiven. A sin is not a process, but happens when the person commits the act. That being said, since this one is eternal and unforgivable, it is my own personal opinion that over a period of time a person would probably become predisposed to committing it, and it may happen without them being aware of it. For example, other sins like pride, arrogance, hardness of heart, resisting the Holy Spirit, could potentially be happening in a person's life, who sweeps them under the rug (no repentance). And by opening up to such sins, allowing them to persist, I think such a person could commit this eternal sin, and even deny they have committed it. That is just my opinion. I also think that if a person exposes himself and opens himself up to false teaching and ignorance, that, too, could make them vulnerable to committing this eternal sin. We must be vigilant, watchful, prayerful, and avoid all sin, so that we do not come to such a place. We must also watch our life and doctrine closely, it will save you. Hold fast to the faithful Word. Is that helpful? Grace and peace. Yes, I see more clearly the different ways someone can commit this sin, thank you, Len. But could you see it as, say, someone who keeps rejecting God, His Word, Spirit and works, etc., and then his eyes are opened and he repents and turns to Christ, would he never come into heaven and be held accountable for this sin for eternity, or would he be forgiven? Dear Jan, God is judge, not I. He knows how to handle each situation. And He will have mercy on whom he will have mercy. The apostle Paul is a good example of someone who persecuted the Church, and received mercy from God. There are others who have persecuted Christians or been atheists and been saved. So I would not consider anyone to be hopeless. Only God knows if they have committed the unpardonable sin. I commented (I don't remember if it was here or elsewhere on your site) about this. Just for extra information, I've prayed and asked God to come and reveal himself to me and for him to save me many many times this week. I wouldn't have that will to repent without the Holy Spirit, which is a sign I haven't committed the sin, right? Also, as I've been praying, many of my addictive behaviors have just disappeared. My sexual sin has just vanished. That's a sign of the Holy Spirit still working in my life, right? Please respond here, as I don't remember where else I commented honestly. Thank you. Thanks for reading and commenting. I probably won't be responding to all your comments on all my articles, but I want to encourage you to keep earnestly seeking the Lord as you have been doing. I agree that it seems the Holy Spirit is at work in your life. Those are good fruits of repentance. I also encourage you to remove any videos from your YouTube channel that are not of God and do not glorify Him, and avoid watching things like that from now on. Here is an article that may be of hepl to you: http://spiritofthelordgod.blogspot.com/2014/03/false-blasphemy-of-holy-spirit.html. Shalom! Josh, how have you been doing with regard to this concern of yours since we last corresponded? Len, I'm sorry, I switched emails so I didn't see your question. Honestly, I've been doing a lot better. Since the last time we talked I read John Bunyan's testimony and honestly I found it amazing how similar his experience was to mine. It still bothers me when I'm trying to sleep sometimes, but I know that God still has a plan for me. Josh, I'm glad to hear of the improvements. So that is quite coincidental that you read Bunyan's testimony since we last spoke, even though I did not mention it until now (you will notice that yesterday I added it to this article above). I did not even know about this, or remember ever reading it until this week. So I think the Lord led you to that to encourage you. The Lord bless you! Joshua, I am not the judge. God alone is Judge of men's souls and He has entrusted all judgment to our merciful Savior, His Son, Jesus Christ. I suggest you repent to Him and plead for mercy. It would seem to me that you are one of many who made that serious error of misjudging the spirits. I have heard of people getting baptized with the Holy Spirit, who had previously been with denominations that don't believe in the gifts being manifested in the church today. So I think there is evidence that the Lord has been merciful to others. Ok, I do believe I the spiritual gifts and I just got baptized in the Holy Spirit c but people told me online it wasn't true and other things about it and I believed it & now I'm worried I'm not forgivable. I started to speak in tongues again but I'm still worried about it. Dear Joshua, I'm glad to hear you were baptized with the Holy Spirit and believe in the spiritual gifts. I understand that you believed the devil's lies for a while, before you realized they weren't true. When a person begins to say things against the manifestations of the Holy Spirit, it is quite dangerous, so I understand your concern. First of all, be sure you have genuinely repented to God for what you said and did when you were deceived. Ask for and receive forgiveness from God. Secondly, I recommend you meditate on the following verses and actively claim the promises for yourself: 1 Jn 1:7,9; Eph 1:7; Rev 12:10-11. I hope this helps. I will pray for you. Let me know how it goes. Shalom! Joshua, how are you doing now with regard to your concerns? About 4 years ago, before I was born again, I remember having called the Bible a "satanic book" in response to someone telling me that in the Old Testament, certain offenses (i.e. working on the Sabbath) carried the death penalty. In the Bible, the sin of the Pharisees which Jesus said was unforgivable was precisely attributing the work of the Holy Spirit to satan. Putting two and two together, I have since had an occasional, subconscious fear that I may have blasphemed the Holy Ghost with my comments, even though I have since come to Jesus Christ, desire to walk according to His word, and seriously regret my comments. Today in particular, this has been bothering me greatly, and is disturbing my walk with Jesus Christ. I am not coming here with the expectation of an infallible response, since only the Lord Himself is infallible, but your input on this would be greatly appreciated, since you seem to know better than I do on this subject. Thank you and God bless in Jesus name. Dear brother Carlos, thanks for reading and commenting. And thanks for releasing me from the expectation of an infallible response, since I don't claim to have one. Secondly, your true remorse for your blasphemy along with your desire to walk according to God's Word shows you have repented. I recommend you meditate on the following verses and actively claim the promises for yourself: 1 Jn 1:7,9; Eph 1:7; Rev 12:10-11. Remember that the devil is the accuser of the brethren who accuses us before God day and night. Remember that we overcome him by the blood of the Lamb and the word of our testimony. Brother Carlos, how are you doing now with regard to your concerns? My apologies for replying so late; I have two email accounts and I didn't know exactly what to say in reply to your first comment. Though I still have some occasional subconscious concerns about this, I am not as tormented by this as I was when I first wrote to you. I would like to thank you for your words of encouragement - they have been very helpful and reassuring. Despite this, I still occasionally worry, as I wrote above, that I may have sinned against the Holy Ghost. After all, I insulted called written with His inspiration "satanic", and I logically concluded that this was cause for serious concern, since the sin of the pharisees in Jesus' time was precisely attributing the work of the Holy Spirit to satan. For this reason, although your words have been very helpful, I do not have 100% certainty that I did not commit the unforgivable sin. Furthermore, it seems I have more difficulty praying as of late, though I'm not sure this has anything to do with it. Once again, thank you and God bless in Jesus name. Bro Carlos, hold fast your confidence that you had when you first trusted Jesus and do not be moved from the hope held out in the gospel. As you diligently seek the Lord, He will reveal Himself to you, and when you are in His presence, you will have the assurance you need. Keep a journal. It's normal to have difficulty praying at periods of life. Keep pressing in and pressing upward. Bro Carlos, I just read about John Bunyan that "He was at one time quite assured that he had sinned the unpardonable sin against the Holy Ghost." You can read about him at http://www.ccel.org/f/foxe/martyrs/fox119.htm. This is a really great article and has been very helpful. I've recently found myself struggling with blasphemous thoughts. I would really like to speak out about my testimony and bring forth better understanding about this. I've done a lot of research on this and I've come across a few articles that say that this sin can only be commited by mouth/out loud. If it could only be commited by speaking, that would really calm a lot of people struggling with this down. What do you think about this? Yana, I am glad the Lord has blessed you through this little article. As for any sin that can only be committed if it is noticeable externally, I don't believe in that. Read the Sermon on the Mount in Matt 5-7. Jesus pointed out that many sins like adultery for example can be committed in the heart without any external evidence. And one can murder someone without touching them, simply by speaking words. The Lord warned against all kinds of evil that come from the heart out of a person's mouth. I do think the Lord judges the thoughts and the attitudes of the heart and nothing is hidden from His sight, according to Hebrews 4:12. However, I would counsel anyone who thinks they committed this sin to sincerely and earnestly repent anyway and cast themselves upon the mercy of God. It may be that in their particular case, the Lord would decide to have mercy. We must repent of sin, not redefine sin in order to justify ourselves. God is holy and He requires holiness of His people. God bless you. Ever since that night, I’ve been in fear and uncertain. I would NEVER keep people from or hinder God or His Spirit–especially His power. He was my everything, my best friend, and now I’m so depressed, fearful, and incomplete. I’m 32 now, and I live with this guilt. A few weeks ago, I had a major depressive episode concerning this which was sparked by someone speaking to me about the contents of that book I read when I was 17. I became very anxious and deeply depressed due to the intrusive thoughts about this sin and hell restarting, and I accepted that I did it. Then I had an intrusive feeling that struck my heart about desiring to die and go to hell, etc which keep hecking me. Those thoughts/feelings are NOT who I am, because it really caught me off guard, but it's like I accepted it. Ever since then, I've been lifeless, and avoidant of God, etc. Is this self-condemnation? I love the Lord, His word, His Spirit, and I miss Him. I’m so saddened, and I feel hopeless, helpless, empty, and devastated. My moral conscience was always alert and feeling, and since this episode a few weeks ago I feel unfeeling, apathetic, and as if I don’t care. I was once a person ablaze for God and His word, and now this. Is this a reprobate mind? So confused and scared. I'm so sorry for the book of an email. If there’s any insight, please help. Dear Christopher, thanks for reading and commenting. First of all, God loves you and Jesus loves you. Secondly, what you said was nothing to be taken lightly and you do need to repent for that and plead with the Lord to forgive you, if you have not already done so. That's what I would advise anyone in your situation. Then I advise you to seek to accept the Lord's forgiveness. I am not the judge and only the Lord knows the thoughts and intentions of your heart and what has happened hear. What use would there be in living the rest of your life like you are going to hell? You need the assurance of your salvation and the hope of salvation once again.